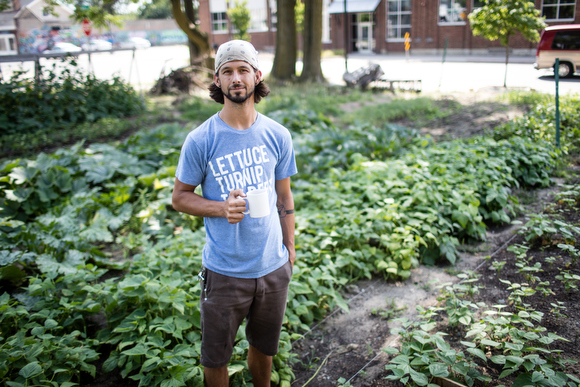 For Urban Roots, farming in Grand Rapids is not just about growing vegetables. It's about breaking down barriers and building community. Walking past a sea of green — rows of zucchini, beets, carrots, and other vegetables covered with the watery remnants of an early morning rainstorm — a group of high school students momentarily stop maneuvering around the wooden plant beds at Urban Roots' relatively new community farm on Madison Avenue in southeast Grand Rapids. The students, and the Urban Roots employees and volunteers using bandanas to pat down foreheads sweaty from working under the late summer sun, are thrilled to hear these words of affirmation from a neighbor of the urban farm: Keep doing what you’re doing. As for what they’re doing that morning? For the students from Grand Rapids Community Foundation’s youth grant committee, they’re learning about the nonprofit to which they recently allocated a $2,500 grant. For others, such as the volunteers who hopped off bicycles to give a couple hours of their time at the green space, they’re weeding and watering and taking care of Urban Roots’ vegetables — expansive rows of green plants that are part of the thousands of pounds of food that the nonprofit expects to grow just this season. Levi GardnerAnd for Urban Roots’ founder and executive director, Levi Gardner, that question of what they’re doing brings about an answer that involves, well, changing the world. It’s an answer that, for Gardner, involves completely rethinking our country’s problematic food system — a landscape where the world’s most productive agricultural systems fails to adequately feed a good chunk of its country’s population. It is, Gardner says, part of a shift he’s seeing take place across the country: an advocacy surrounding growing your own food. In other words, it’s a dialogue centered on the fact that words like ‘organic’ and ‘local’ do not have to be synonymous with cost prohibitive, nor relegated to the parlance of those who can afford to fill shopping carts in the pricey aisles of places like Whole Foods. It’s about health and food and community building and learning outside the classroom and, in a world filled with barriers to connecting, it’s about breaking down walls that keep us from truly knowing, and working with, our neighbors. It’s this sort of big picture thinking that has quickly placed Urban Roots on Grand Rapids’ radar since Gardner launched the organization in 2013. Following its inception three years ago, the group has moved from gardening on a couple small plots around the city to just this April headquartering its operations at 1316 Madison Ave. SE, grown thousands of pounds of food that they’ve sold through their CSA (Community Supported Agriculture) program and farm stand, launched a mobile classroom project that aims to support urban gardening throughout the city, gotten numerous grants from both national and local organizations, and landed nonprofit status. And that’s just the beginning. Next year, Gardner says he expects they’ll have a pollinator garden, bees on the roof, and a chicken coop. Plus, the team at Urban Roots has big plans for a $1 million fundraising campaign to help them offer an educational center that would include a commercial kitchen and classroom, a residential place for interns to live, a public green space for everything from workshops to potlucks, additional acreage for growing food, an off-the-grid building that meets the highest possible environmental standards, expanded public programming (such as their initiative to help residents and organizations throughout the city build and maintain their own urban garden), and more. Of course, a lot went, and continues to go, into that placemaking. So, how did Urban Roots get to where it is now? Ask that of Gardner, and the answer you get has a lot to do with quite a bit of soul searching on his end. While attending school for his Master’s at MSU around 2010, Gardner was helping Grand Valley State University launch their own community garden, during which time he learned “a ton” about farming. Still, while he was grateful for his time there, he knew he needed something different. So, to assess his own interpretation of urban gardening and the role it could play in Grand Rapids, Gardner started piecing together the mountains of information he’d accumulated in recent years, from his travels to agricultural spaces around the country and globe; “a million books and TED talks and conversations and teachings and existential crises;” and the book "How to Grow More Vegetables: And Fruits, Nuts, Berries, Grains and Other Crops Than You Ever Thought Possible on Less Land Than You Can Imagine," a tome that has most heavily influenced his model of farming, called bio-intensive farming — essentially an organic agricultural system that aims to maximize growing potential on small plots of land while increasing biodiversity. In other words, a sustainable way to practice urban farming. After sifting through all of this, Gardner decided to leave GVSU and launch Urban Roots in 2013. When he began, he was farming on a couple different lots in the city, including one on Wealthy Street, as well as selling produce at markets and teaching workshops. And while Gardner knew he wanted to do his own urban farming and promote it within the city, he still wasn’t entirely sure how this would all take the form of something long-term, and sustainable. “I was having coffee with people and curating these ideas and kind of going, ‘What’s next?’” he says. “For me, a big turning point was going to Nicaragua for a month last year to study permaculture. I left there going, ‘I’m not just a guy that wants to be an urban farmer anymore. I want to build something. Just one year ago, Urban Roots was partially operating out of Gardner’s house. Then, he got a phone call about an available building next to an acre of space on Madison Avenue. The group relocated to the space last winter, but they didn’t begin to touch the ground for planting until April 1. Since the move, life has been even more of a whirlwind than before. The group, which currently funds three and a half full-time employees and works with an impressive roster of volunteers, received a grant from the YMCA to purchase an ambulance that is being renovated to serve as the group’s mobile classroom, and they landed a grant to build mini greenhouses. Plus, there was a $40,000 grant from the National Association of Conservation Districts, which was in partnership with the Kent Conservation District and allows, among other things, Gardner to receive a salary for the first time since he has started Urban Roots. Most recently, the nonprofit received a $10,000 grant from the CDV5 Foundation. Ultimately, Gardner is hoping to build something akin to the community farms he has visited around the country, including Growing Home on Chicago's south side, an area that is classified as a food desert (in other words, residents have little to no access to fresh and affordable fruits and vegetables). "It's a former industrial area with high rates of unemployment, injustice, increased amounts of diabetes, asthma, the usual shabang," he says. "And then, in the middle of all of that, is this two-acre farm started by the Coalition to End Homelessness that works with 40 formerly incarcerated individuals, giving them job training, providing fresh food for the community, helping them to increase their own economic reliability, educating students, beautifying the city. When I saw that, I went, 'Yes! That's what I want to do.'" In order to do that, Gardner has looked to the surrounding community and is linking hands with an increasing number of neighbors. The number of community groups they’ve partnered with for the mobile classroom program has grown from five to nine. This growth in partners is something that’s particularly important to Gardner, and others at Urban Roots, with Gardner stressing that, as a white male going into a neighborhood where many of the residents are people of color, he understands there will be criticism and fears of gentrification. “We want to do not just what’s OK, but truly what’s best in the neighborhood,” says Gardner, who has gone on to work with such places as Bethany Christian Services, Madison Square Church (located just down the road from the farm), and YouthBuild, as well as individuals like Third Ward Commissioner Senita Lenear. With these partnerships, Gardner hopes to integrate into the neighborhood and provide a space where everyone can feel comfortable, from those who need a free meal (Gardner consistently stresses that, while he sells produce, he’ll never turn someone away who needs vegetables at no cost) to individuals who’d like to lend a hand with the plants. Almost immediately after Gardner knew Urban Roots would be relocating to Madison Avenue, he began reaching out to community groups, including Justin Beene, the director of the Grand Rapids Center for Community Transformation, a partnership with Bethany Christian Services. 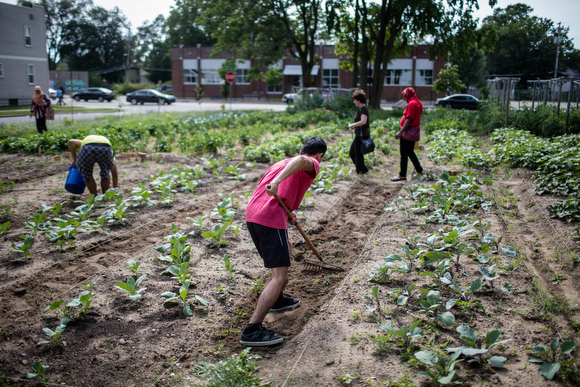 Beene’s center has been closely working with Urban Roots, including connecting the nonprofit with seven teenagers who were members of the urban farm’s youth corps program that aims to give younger Grand Rapidians job and career experience. Partnering with the Grand Rapids Center for Community Transformation has proven to be a crucial relationship for Urban Roots, particularly when addressing the topic of gentrification, Beene notes. “Levi’s got a great head on his shoulders; he’s really smart and articulate and has a great vision,” Beene says of Gardner. “I asked him, ‘Are you willing to give that vision away and let it be owned by the community? Additionally, Beene says that he’s “excited about Levi’s vision,” including the expansion of self-grown food and exposure to healthy, organic produce. The Grand Rapids Center for Community Transformation plans to grow its partnership with Urban Roots, with Beene saying that the center will be sourcing much of their food for their coffee shop and deli at 1530 Madison Ave., Rising Grinds Cafe, from Urban Roots. Janean Couch, a program officer at the Grand Rapids Community Foundation, too says her organization has been pleased to link arms with Urban Roots, and high school students from the foundation’s youth grant committee recently gave a $2,500 grant to the nonprofit in order to support both the urban farm, as well as youth programming there. The 30-member committee allocates approximately $45,000 to various groups and causes throughout Grand Rapids each year. “They are so committed and so passionate and so socially conscious,” Couch says of the students who recently toured Urban Roots to both volunteer and see how their grant funds are being spent. 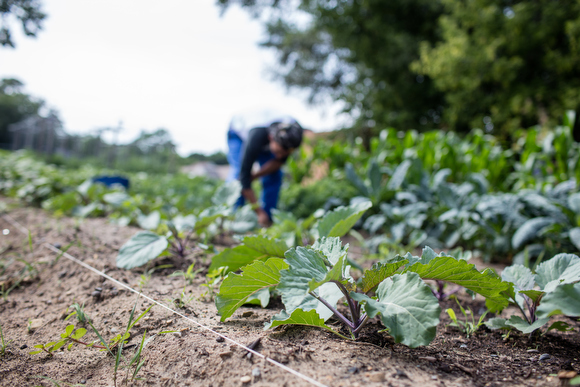 With all of this — the farm and the community partnerships and the daunting task of changing a world very set in its ways — comes a deeply rooted hope that, vegetable by vegetable, gardening class by gardening class, the city will begin to transform. That it will become a place where everyone yells “hello” as they walk by a garden filled with workers and volunteers who, by 2020, are expected to grow as much as 80,000 pounds each year. That it will be a place that never stops tearing down barriers and building community. “The thing I grow tired of is our silos, in every regard: professional silos, social silos, theological silos,” Gardner says. “We’re all human, and the earth is real. Sometimes I get tired of people who say they are, or are not, an environmentalist. To say you’re an environmentalist is to say you even get a damn choice. That’s not your choice. You’re not that powerful. The beauty of the earth humbles us all. To find out more about Urban Roots, you can check out their website and find them on Facebook, Twitter and Instagram. To connect with Gardner and his team about volunteering, touring the garden and more, email info@urbanrootsgr.org. You can also head to the nonprofit's next volunteer orientation on Friday, Sept. 30 from 11am to 12:30pm at the garden (1316 Madison Ave. SE). For more information about the orientation, click here. All upcoming events at Urban Roots can be found here. Anna Gustafson is the managing editor at Rapid Growth. Connect with her via email (AKGustaf@gmail.com) and on Facebook , Twitter and Instagram.